I wrote a piece for the Financial Times about architecture in Karachi, a city I’ve lived in. It’s full of beautiful colonial-era architecture, but the prevailing attitude has been to knock down the old and build new, more profitable buildings. The article looks at attempts to preserve these heritage buildings in the face of rapid expansion. Today, Karachi, the sprawling megacity on Pakistan’s southern coast, is best known for violence. As the country’s economic hub, it has undergone an exponential rise in population, from 435,000 in 1947 to between 18m and 25m today. An underfunded and undersized police force has struggled to keep pace, and Karachi is home to a complex web of vying criminal gangs. Police figures show that there were 2,700 murders in 2013. Of course, this was not always the case. 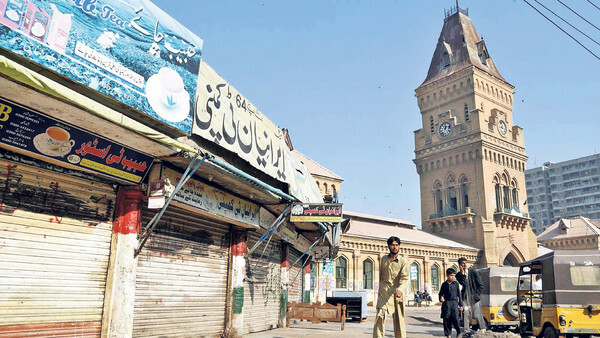 The British arrived in Karachi in 1839 and declared it the capital of Sindh province in 1843. A port city, it quickly became immensely prosperous. It contains many architecturally significant buildings both in the elite enclaves, built by the British and continued by wealthy locals, and in the older parts of town, which predate colonisation. Since most Mughal and Sultanate period architecture is found in Lahore, Karachi’s buildings have traditionally not been considered historically significant, but the city’s structures were built by local craftsmen, and often commissioned by local merchants. You can read the full article over at the Financial Times and I’ll post a clipping soon. Last week, Downing Street announced that it would hold an investigation into the operations of the Muslim Brotherhood in London. 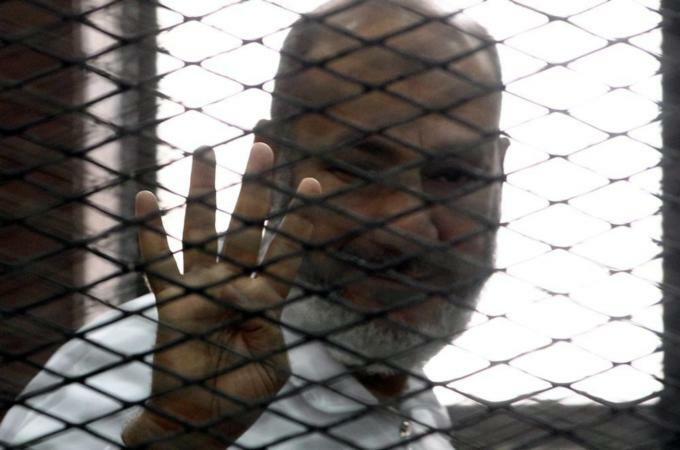 The inquiry aims to establish whether the Brotherhood is a threat to British national security. Given that the organisation is the biggest political force in the Middle East; that it was, until recently, in power in Egypt; and that its affiliates remain in power in many different countries in the region, the suggestion that it is involved with violent extremism in the UK has been controversial. I wrote a piece for Al Jazeera, unpicking the possible reasons for the inquiry. A UK government spokesperson said it was “possible, but unlikely” that Britain would follow its allies in Saudi Arabia and the UAE in classifying the Muslim Brotherhood as a terrorist organisation. The full piece is over at Al Jazeera’s website. 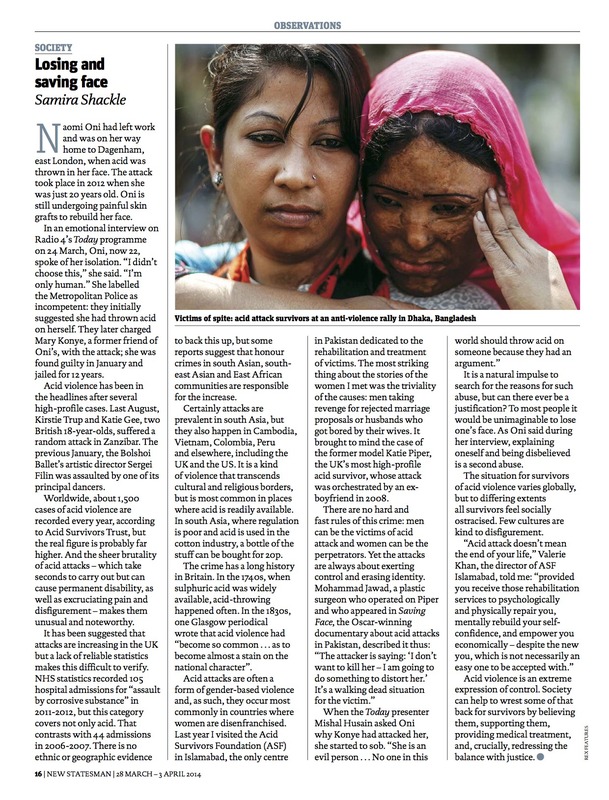 I wrote a piece for this week’s New Statesman about the horrific crime of acid violence. The piece looks at recent incidents in the UK, and explains some background about the crime globally. Here’s the opening, and the cutting is below. Naomi Oni had left work and was on her way home to Dagenham, east London, when acid was thrown in her face. The attack took place in 2012 when she was just 20 years old. Oni is still undergoing painful skin grafts to rebuild her face. In an emotional interview on Radio 4’s Today programme on 24 March, Oni, now 22, spoke of her isolation. “I didn’t choose this,” she said. “I’m only human.” She labelled the Metropolitan Police as incompetent: they initially suggested she had thrown acid on herself. They later charged Mary Konye, a former friend of Oni’s, with the attack; she was found guilty in January and jailed for 12 years. You can read the full piece here. 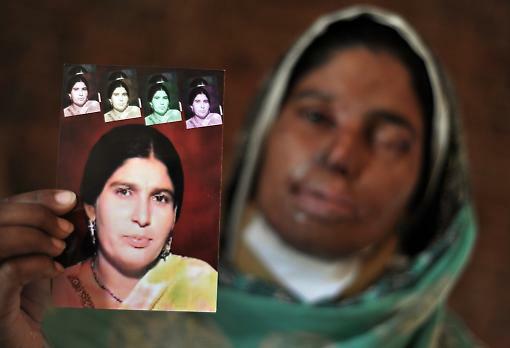 It’s not the first time I’ve written on acid violence. Last year I spent time with survivors in Pakistan – one of the countries where it is most prevalent. You can read that article here.